Hi! Generally speaking no, this shouldn't be an issue. As long as everyone has their own accounts with separate e-mail addresses and information, we can usually tell that they belong to separate individuals. Enjoying the site within the rules will usually not trigger any alarms, but if there is suspicious activity (evidence of cheating or harassment for example) from one account, it could affect others, but generally speaking you should be okay! Happy to hear it! We definitely don't want any part of our community to feel unwelcomed or forgotten! I'll pass on a note to the content team as well to see what they can do! Yay! *starts to string along popcorn for decoration, gets bored and eats the popcorn instead* Hmm, we haven't been in touch with old Sid in a long time. He's not too good at returning phone calls, ya see, with the being a punchbag and all. Maybe the new year will inspire him to come out of hiding. We're glad you enjoyed it! That's good feedback. 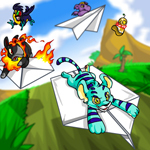 We don't have any plans for this right now, but as we start to plan for the future of Neopets and potentially converting features away from flash, we'll keep this in mind! Hi! You can still buy stockings in the mall in packs of 10, 5 or 1. The only ones we stop selling right away are the 25 packs, since you can only fill out all 25 days before the event has started and we don't want you to accidentally purchase stockings you can't use! That wouldn't be very good holiday spirit at all, now would it? Oooh yay, shiny! The facial expressions one is something we haven't thought about, as you could accomplish this as you said, by letting the pet go hungry, and creating an item that does this is easier said than done, but you never know what we could create in the future. As for the side accounts one, we have talked a bit about if there is a better way to approach side accounts and having more pets and all that, so making some changes in that regard isn't off the table. Since I know you guys hear things like that a lot in the editorial, I'll give you a little Christmas bonus - insider info! So right now, we're at a point where our developers are really focused on 2 things - working on events and new content for y'all to enjoy, and fixing issues/working on things in the back end to keep improving site performance. So, while they work on those things, we're also looking ahead to what other things do we want to do, both in terms of fixing old content, creating new features and changing things that aren't done as efficiently or modern as they could be. We've got a bit of a list going of what we want to tackle when our developers are able to take them on. So, when you hear us say things like we're looking into it or talking about it, they are usually on that list! Hi! It's not something we've really talked about, but it's also not something we're against doing. To some degree though, this is your avenue to do that! Sometimes it definitely seems like I get more questions that are either sassy rants (I'm not against some sass, hello, I am the queen of country, but if it's not useful or constructive, it won't be answered here), asking for support help (I swear I can't unfreeze your account), or asking me why I don't answer more/better questions, than I do actual questions. So, Neopians, ask me anything! You all hit a home run with the white Christmas side tree. It's absolutely gorgeous. I can't wait to see what's next! Jinjah cookies for everybody! New colours can be tough. What on Neopia could possibly relieve our boredom? Being a guard ain't easy. But it works so well!